I'm sure we all know people who have left or are leaving because of the levee breaks and flood. New Orleans is losing some great people. There's a flip side to that, though. There are a lot of good jobs available here now. Today. I was stunned to see the number of "Professional" listings in the Sunday T-P today, and there are some good ones in there. In addition, there are not enough local applicants for those jobs. Anecdotally, from the experiences of others and me, I know that people are not getting a lot of great applicants when jobs open. Is this a crisis? Is it time to panic? The first post-levee break migration wave was (is) the people who leave because of job loss, disgust, opportunity elsewhere, hopelessness etc. That's a painful process, but its inevitability means we must steel ourselves and deal with it. However, if things work the way I think they will, the second migration wave (after this initial outflow) will be people from other places moving here to fill sustainable jobs left empty by those who needed to leave. These newcomers (or returning Orleanians from years past) will come because of word of mouth, noble visions of participating in rebuilding, selfish visions of frontier-style opportunity, whatever. That influx of talent (in the next 6-12 months) won't be enough, though. The really interesting wave will be what happens with or immediately after that. The grim future would be that those second wave people will get disillusioned with New Orleans or the pace of rebuilding and then leave. That could happen, but we need to be conscious about aiming for a different future. That second wave of people is coming with ideas, expectations, and (not insignificantly) spouses and significant others. Let's call those ideas and SO's the third migration wave. That'll be the dynamic that I'll be watching, encouraging, and trying to engage. The people who get hired in the second wave will be plugged into established businesses and institutions. But their significant others might be the people who help create new industries and institutions. Imagine a software engineer married to a researcher that Tulane brings in. Or an investment guy whose girlfriend gets hired as an attorney for the Army Corps. 6) Outside money does not create opportunity, it finds it. 7) World Class is not going to come from above, it is only going to come from within. 8) "If nothing changes, then nothing changes." Twelve months out from right now, when those significant others are getting established here and are restless and looking to get things done--that's when some really exciting things could happen. We need to nurture that and be ready for it and participate in it. Just in case, spruce up your resume. Heck, do it now. Some of this might already be starting. Postscript: By the way, if you were thinking about applying for an opening in the backfield of the New Orleans Saints, don't bother. THAT POSITION HAS BEEN FILLED. Yes. Again, what exactly is 'neighborhood planning'??? Neighborhood plans are echo chambers for empty wallets. The zoning law and the budget are where the action is. All the rest of this is for the cameras. A recent study by sociologists at Duke and the University of Arizona found that, on average, most adults only have two people they can talk to about the most important subjects in their lives -- serious health problems, for example, or issues like who will care for their children should they die. And about one-quarter have no close confidants at all. Then Ashley wrote today about something distinctive and tragic about the Ninth Ward: despite relative poverty and the problems that go with poverty, the Ninth has a high rate of home (or, thanks to the ACOE now, rubble) ownership. Extended families living together is the explanation of that oddity, which is now being obliterated by the inept (or perhaps purposeful) federally incentivized breakup of those families. interactions of communication, trust and commerce that make urban life what it is. Tragically disrupted, the potential for restoring something like the former status quo fades further away each passing day. Remember inertia, objects in motion... remain in motion... etc. Scary and accurate and wrenching stuff from Mr. Mel. The B.S.ing in line while waiting to get a beer at a Hornets game, the street talk, the complaining about Entergy while waiting to pay your bill . . . a lot of that gone, because almost half of the people who were supposed to be in line with us aren't there. But still . . . but still . . . but On the Other Hand (Randy Travis) . . .
That New York Times article above? Doesn't apply. That's based on surveys of Americans. We're not they. I hereby posit that there are fewer lonely people in Orleans Parish, Louisiana, United States of America, than in any other parish or county in these United States. That's what makes Ashley's and Mr. Mel's point all the more tragic. We're Orleanians. We don't do "lonely." At least not well. And not for long. If Rockin' Ray Nagin's gonzo event planning could be derailed, consider a simple alternative that will put chills down your spine and could be a political, aritistic and moral statement easily understood on the world stage. The night of August 29, we should project the 2002 Halftime show by U2 onto all sides of the Dome. The 12 minute set was Beautiful Day, MLK and Where the Streets Have No Name. ...After the flood, all the colors came out. ... If the thunderclould passes rain, so let it rain, rain down on me. So let it be. ...I want to dance in the dirty rain, where the streets have no name... the City is a flood, and olive turns to rust. We're being beaten and blown by the wind, trampled to dust. ..
Not much need to comment on this boneheaded idea. The Army Corps of Engineers are incurably stupid, and that's not news. If the Army is treating Iraq with the same deft touch, you can see why things over there will not be moving faster than possible to a stable outcome. So Dillard University has now decided to begin its academic year on September 25, when the bulk of the hurricane season is finished. Gee, I wonder where they got that idea? Okay, I know I can't claim ownership over the notion of having our academic year reflect our geographic and climatological realities, but I am certainly glad to see Dillard taking an outside-the-box approach. That is leadership. Yes, it's not a huge issue, but that's evidence of flexibility and creativity. Too bad other institutions seem to love life inside the box. There is a scene in the film Syriana where Matt Damon's character is talking with the Prince of the fictional Emirate and after the Prince appoints him economic adviser Damon says, "You want an idea, here's an idea." Then, he proceeds to lay out a strategy to change they way they market their crude oil. He concludes with, "Your profit just went up by a factor of three, possibly four. I think that's a pretty good idea." For a movie about the power of oil, the point of this scene is to illustrate that those blessed with the riches often satisfied to let the world beat a path to their door instead of using it as economic leverage. Take, for example, the fact that New Orleans has/had a tourism dependent economy. Given that, it is unlikely to recover while the worldwide perception of New Orleans remains a place of devastation, martial law, crime, and blight. For now New Orleans is somewhere between Sarajevo and Beirut in "Top Ten Cities Destroyed By Armies" tour, and that's it. Meanwhile, the global airline business is in the process of modernizing. Longer range aircraft are soon to be delivered by Boeing and Airbus. These are planes that can bypass the hub and spoke system, particularly for international travel. ... we made it worth their while. Forget subsidizing Home Depot and Lowe's with our recovery plan for a moment. What if Louisiana took some of the funds it received from record high oil prices and created a fund to subsidize fuel purchases by airlines servicing Louis Armstrong Airport for the next two years? The caveat could be that it would be targeted at large planes from more than 1,000 miles away. Oil is power. In a world dependent upon petroleum, why not use that power to influence the behavior of others? This is a perfect alignment of Louisiana's strengths and weaknesses with that of the airline industry. Even better, it is one area in the airline service sector where Louisiana has a competitive advantage over Mississippi's gigantic Stennis facility. And, speaking of Mississippi, it is very likely that visitors from Europe, South America and Asia that come to New Orleans as their port of entry to the USA would want to be in New Orleans, and are not going to be tempted by cheap rooms in Biloxi like some kind of bowl game crowd. Unfortunately, though nearly painless, one can suspect that the smugly emboldened Kenner-diots [those who bought homes next to an airport and then wanted it closed to improve their property values] would not see this as an elegant solution. For them, picturing the view of giant aircraft stacked up over the Manchac swamp as far as the eye can see would provoke the look of Tom Cruise in "War of the Worlds". Further, can you see other parts of the state 'giving away' windfall money from high oil prices to something in New Orleans? 5) Government spending alone will not return the City from the one hundred fiftieth or so largest city in the nation back to the 31st largest. 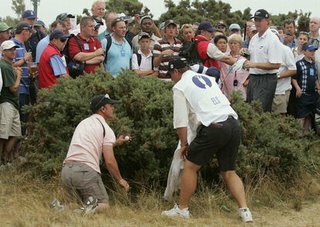 8) "If nothing changes, then nothing changes"
Above is a picture from this weekend's British Open, being held at Royal Liverpool. Have you watched any of this? Anyway, then I saw what the Royal Liverpool course looks like as it hosts the world's greatest golfers. The picture above (Ernie Els looking for his ball) gives you a sense. On the radio, I heard Jim Rome call it a "dog track." I don't know if I'd go that far--and I know "links golf" is a different animal--but the course doesn't exactly blow one away aesthetically. Which brings me to City Park. Hey! Our municipal course looks just like their world class course! 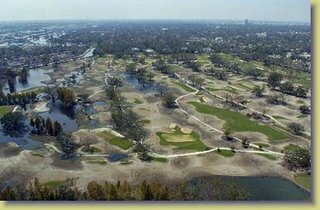 A little creativity, a little marketing, and bing: the Royal Bayou Oaks Links. The "Royal" part could come from financing from, say, Saudi Arabia or Dubai. And it wouldn't take much financing to turn what's out there now into a links course. Within weeks, I'd have Berto taking pictures of me during a round looking just like Ernie Els abve. And Berto would be making fun of me as he handed me a can of Miller Lite, the official golfing beer of Dillyberto. Benjamin Wren was and continues to be a tremendous influence on the lives of Dr. Mrs. Clio and me. He gave us a world class education in world civilization, Zen, and humanity. He celebrated our wedding and baptized our first child. When he was in his 60s, he discerned a change in vocation, a call to be married. His wife, Pat, must miss him, as do we all. Berto is back! After a new parenting-induced hiatus, the handsomer half of Dillyberto is writing again. Our New Orleans Saints--the blog of the black and gold, philosophy, and bicycling--is warming up for the season with bold but sensible predictions about our upcoming 16 Sundays of Glee, 8 of them in the Louisiana Superdome. Please visit Berto, consider his prognostications, and wish him continued enjoyment of Lil Berto. (BTW, Lil Berto will shed his pagan ways this Sunday morning and become a papist Christian. I, Mr. Clio/Dilly, have ensured that a keg of Abita Wheat will be on hand for the after-party.) Not sure if Lil Berto is up to drinking Abita yet, but no kegs of breast milk or formula were available. I biked over to the Tchoupitoulas Winn-Dixie early yesterday morning to pick up some coffee. As I locked my bike outside, Mr. John Goodman came out of the store alone, clenching a cluster of somewhat heavy grocery bags. This is the second time I've seen Mr. Goodman in a grocery store. A few years ago, it was in the Metairie Road Langenstein's. I've also seen him at the Fair Grounds Race Course, and I hope to see him again there this fall. Yesterday, Mr. Goodman loaded his groceries into his black Mercedes, climbed in, and with clear enjoyment lit up a large cigar. At 8:30 on a Sunday morning. Mr. Goodman spoke highly of New Orleans on the Spud show. I am very happy to see that he has returned to his Garden District home and is making a go of it here. He is a great advocate for the arts and for the film industry here. 1. I take this very seriously, especially what is implies about curriculum and facilities in New Orleans. We need to get off our asses. And I don't mean just public school teachers, administrators, and families. I read the Orleans recovery district needs to hire 500 teachers. Where are they going to find them? 2. A symptom of why our public schools are so down-in-the-dumps: please note that the article doesn't bother to question Orleanian private school kids who went to out-of-state private schools. I think private schools here often get a free ride from the Picayune and other power-brokers in the city. Private schools need to be held accountable too. Show us your test scores, Fr. Maestri! Let's see those scores, Newman! And not just scores of kids when they graduate. I want to see the scores of when they enter your schools. Then we'll know if real education is going on. If you're taking 88th percentile kids and graduating them as 88th percentile kids, you haven't done anything. 3. I really am happy to see this kind of article, but I think it's completely unquestioning of the "grass is always greener" bias. I think the T-P could've told this story with the same justifiably critical stance about New Orleans schools, but with a few comments about whether those out-of-town schools will still look as good in a year to these kids. 4. I take seriously what I have placed in the masthead (?) of this blog. We care for one another here. I firmly believe New Orleanians are not as lonely as other cities' people. Also, there is no poser action here. Those qualities are part of what makes us special, and I wonder if we can use that in resurrecting our schools. In the beginning, we still won't have the facilities and test scores of other places, though we need to get there SOON. However, I like the idea of my kids hard at work in schools that are mannerly, caring B.S.-free zones. I think that's an asset we can use. B.S-free zones also provide the right environment for cultivating creativity that matters. "We agree that I-10 needs to be open as an evacuation route, and we're not asking to do anything unless and until the evacuation is complete. It is not going to become an issue until the middle of an event when I-10 is closed anyway," Young said. "It seems to me there is no perfect solution and we ought to err on saving homes from being flooded. "If homes get flooded again, a lot of people are not coming back. A lot of people tell me they do not have another flood in them," Young said. 1. "until the evacuation is complete": During the Katrina/levee break crisis, when exactly was that evacuation complete? Guess what? IT WAS NEVER COMPLETE. In America, in a major metropolitan area, I doubt that an evacuation will ever be complete. Thousands of people will always stay behind, and because we're not a police state, I don't think the government will force them out at gunpoint. This means that Councilman Young's plan will knowingly strand people in Orleans, St. Bernard, and Plaquemines parishes. 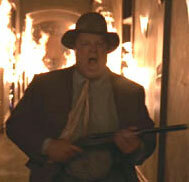 I'm sure he'd say they could take the Crescent City Connecion or Huey Long to escape. Well, last time our fellow citizens tried that, they were met with gun-waving Gretna police. 2. "A lot of people tell me they do not have another flood in them." I can definitely understand that. However, is the solution to flood purposely a major evacuation route and the interstate highway system? I've got a solution for people who don't have another flood in them: RAISE YOUR HOUSE! Why is it that because fate decreed that the 17th street Canal would break on the Orleans side, only the Orleans people have to raise their houses? Meanwhile, on the Jefferson side, where many people didn't flood or only flooded because the pump operators ran away, I don't hear talk about raising houses. When are Metairie and Kenner going to face the fact that they are victims of horrible (Read: greedy) development planners (Read: nonplanners) from the 1950s and 1960s, who built California-style slab housing in a former wetlands? I'm not angry at Jeffersonians for that. However, fate, nature, and the ACOE's failure have FORCED Orleanians to confront reality (and many Orleanian houses were built raised to begin with). By sheer luck, Jefferson avoided fate, and their leadership is using that luck to argue that Orleanians' escape route should be cut off. The Greater Covington NAACP sent a letter to Strain’s office, demanding he retract his statements as being unconstitutional. Letters were also sent to the offices of U.S. Attorney Jim Letten and U.S. Attorney Alberto Gonzalez, apprising them of the situation. The most newsworthy aspect of the excerpt above? A. Sheriff Strain seems upset about certain kinds of haircuts. B. There is such a thing as a "Greater Covington NAACP." C. There are enough minority citizens in St. Tammany Parish to justify the existence of a Greater Covington NAACP. D. Both "B" and "C."
If you chose "D," you're correct! UPDATE: Great letter to the editor today from a Northshore pediatrician whom Dr. Mrs. Clio knew back when the Clio family lived on the Pearl Riviera. As the one year anniversary of le Deluge approaches, and with the few sparks of recovery flickering in the face of overwhelming blight, it seems likely that this period of time will go down in the history of New Orleans as the lost year. Over the ensuing months and years, it might become apparent that we lost more of New Orleans in this last year than was lost at 9:45 am. on August 29, 2005. After all, from the initial 'dewatering' of the City, through the Baker Plan and its demise and onward to the LRA it seems the primary focus of efforts were/are directed entirely at reclaiming the property/wealth/collateral lost in the flood -- whether insured against the loss sustained or not. But in the meantime, we lost major parts of our community. Money, even Other People's Money, does not have the ability to re-build a community; after all. Keynesian economics (upon which the idea that you can spend your way to prosperity originates) assumes a closed monetary system. Not surprisingly, our President got an MBA from Harvard when this theory was still in vogue. It was debunked by events. Economic theory now recognizes that unproductive economic units [from teenagers to Airbus] do not generate surpluses, they require subsidies. Economics 101: Growth creates surpluses which can fund future investment while subsidies evaporate. Here's one reason why you cannot 'create' prosperity with subsidies: If beneficiaries of economic aid have the ability to extract funding from the system, then the situation is not unlike that which preceeded the 'debt crisis' of Latin America in the 1980's and beyond, i.e. politically motivated subsidies will find their way from political beneficiaries to economic productivity outside the system. Why did every well placed bureaucrat from Latin America have a condo in Miami? During this lost year, what is truly lost the millions of daily interactions of communication, trust and commerce that make urban life what it is. Tragically disrupted, the potential for restoring something like the former status quo fades further away each passing day. Remember inertia, objects in motion... remain in motion... etc. Yet, the culpable myopics will have the focus of attention elsewhere, for whatever reason. Since the passage of the appropriations bill that funds the LRA, there has been a chorus of outside voices calling for a solitary 'Plan' to re-build the City, then noting the lack of this idealized plan and/or wanting to 'see' the plan. Invariably, the talk is about the tangiable, but the greater loss is the intangiable potential of our August 28, 2005 community. 225,000 people working 80 hour workweeks cannot replace the regular work of 498,000 people. New Orleans does not have half a million people, it does not produce enough to employ the families that include half a million people, so it no longer needs housing for half a million people. The Baker Plan and the LRA all assume that if you give people the money for new housing in affected areas, they will rebuild those areas. How is that going to work when those areas are not safe? 1) The Corps of Engineers is building something they say will prevent the last flood on the east bank, west of the Industrial Canal, but it is not going to be done until after this hurricane season. Other areas have much more exposed levees and will be completed over the next few years. In the meantime, there will be a greater risk of flooding in a slow moving minor tropical event for two years or so while the pumping situation at the gates is resolved. 2) FEMA has certified that the Base Flood Elevations will require raising or razing most of the catastrophically damaged homes in order to get NFIP flood insurance. The height required for this level of insurance protection was calculated without figuring out any of the hydrology of the Corps new gates/pump system and its possible failures. So rebuilding to the insurable height might still result in flood damage for the next few years. 3) Areas to the east of the industrial canal are going to have less flood protection in the short run than areas to the west. Real estate prices will continue to reflect this risk whether insurable or not. 4) The LRA cannot force people to re-build where the loss occurred. People remain in charge of their property. So, some zip codes will remain blighted even after the LRA money leaves Baton Rouge because the money isn't going to go immediately into housing. 5) None of the four points above have anything to do with decisions to be made by City government, yet they will all have a critical impact on the City's demographics, economics and housing stock recovery rate. One element to the 'sniping' about there not being a 'plan' is that it absolves those in DC and Baton Rouge who have had the ball for months of this lost year from accepting blame for the micro-recovery. Based upon the timeline of the four factors above, it is not likely that substantial work on new housing in affected areas will commence before a year has passed. In that year, tens of thousands of people have left town, found adequate or better jobs, have found a place to live and may never return. If there is planning to be done, it needs to be less about which members of the oligarchy sit on which committees and more about how we build a sutainable economy on the surviving base. In the meantime, it may look to those people who have received insurance funds more like impaired New Orleans real estate is not the place to put their nest egg. Some money that could be re-building affected areas is undoubtedly compounding interest in money market accounts awaiting real flood protection being built, awaiting real political reform, a real education system, and a real 21st Century economy. If Lake Ponchartrain was an active volcano, would civic guilt alone be enough to entice a half million people to move in? If New Orleans needs a plan, the plan is not about how to get New Orleanians to return to an abandoned city, it is about planning a 21st Century New Orleans for whoever wants to be here. Cut out this article and mail it here with a solid proposal to host at least one of the 2008 'debates' here? Remember how we ended up with the Hemmeter/Caesar's/Harrah's trainwreck because Sidney leased the Rivergate to Hemmeter but the State gave the license to gamble--usable only in one location-- to the local Jazzland group? After contemplating that (or, if you were lucky enough not to lose your copy of Bad Bet on the Bayou to le deluge and can re-skim a few chapters) re-read today's summary of the planning disputes between re-elected parts of the Council, the Re-Elected Mayor, the LRA, the GNOF and the deep pocket group from out of town that wants to put its mark on the future of New Orleans. Does your mind start to associate some of the things about the first train wreck with the present situation? The LRA is planning, the neighborhoods are planning, the retreaded-Council is planning, the new Council has ideas, and the GNOF is planning. Is it really time for more talk, and less action? Or, is there some sort of secret -- pardon the pun-- plan afoot here? Is the planning process an excuse to delay at the Statewide level? Is there a vast conspiracy to allocate and re-apportion the CDBG funds in Baton Rouge to meet the political goals of the State as a whole, not just the affected areas? As noted before, despite its breakdowns, New Orleans has a land use plan, it has a process, procedures etc. To the extent it needs to be fixed, that will require a change in the law, but isn't that what the last election was just about? Didn't we decide to re-elect the guy who trusted that out of a million or so affected people, most did the right thing and got out of town. Isn't his approach to re-building 'come get a permit and get to work'. Philosophically, a 'Big Plan' takes a long time to commence, while thousands of individuals 'little plans' could. Individual planning makes for poor television but work does happen without cameras. Frankly, recall when Nagin had the balls to stand up to Reps. Christopher Shays, "Little Buddy" Shuster, and Steve Buyer when they decided to riff on some sort of new Rovian Tenth Amendment where all bad publicity --even that specifically the direct fault of a failed federal agency or two, is somehow delegated to the States, or, its people. In their Orwellian world, Nagin's mandatory evacuation order was supposed to be followed up with something like mass arrests of (suspected Democrat) citizens who were guilty of violating the law with the intent to make the President look bad. Is a mandatory recovery plan any more likely to work than a mandatory evacuation order? Finally, as you contemplate a cold Pimm's Cup over the weekend, let's play an interesting hypothetical game; suppose New Orleans had just elected Thomas Jefferson as Mayor. What would he do differently than Nagin has done? What would Hamilton's approach been? Have a happy Fourth of July, and consider this point, Jefferson's greatest legacy to Louisiana may not just be the Purchase, but rather, the enlightenment for us all to question the role of centralized power for the sake of centralized power in a world that is frequently coming to resemble small pieces loosely joined.